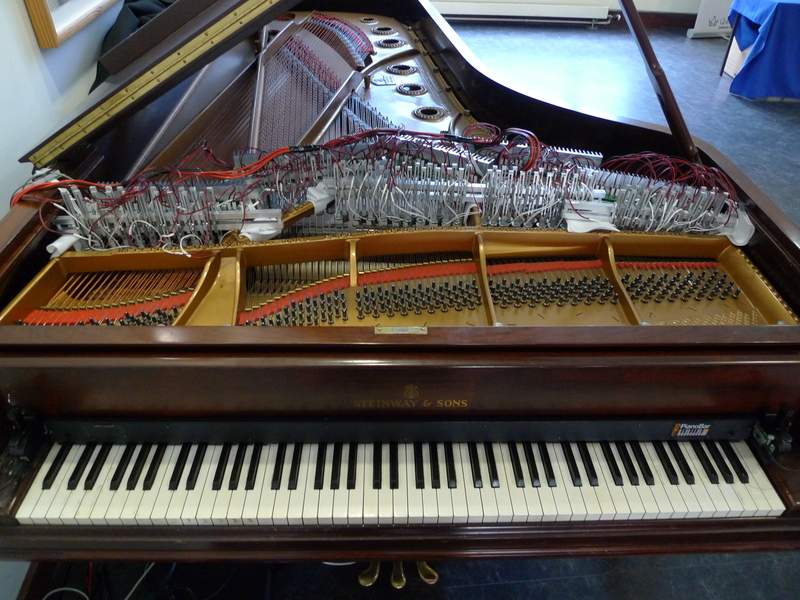 The magnetic resonator piano (MRP) is an electromagnetically augmented acoustic grand piano which uses electromagnets to induce vibrations in the strings. The MRP is played from the piano keyboard using an optical scanner that measures the continuous position of every key. The instrument is capable of infinite sustain, crescendos from silence, harmonics, pitch bends and new timbres, all produced acoustically by the piano strings and soundboard without any external speakers. This event will begin with a performance by music composed for, or adapted to, the magnetic resonator piano. A talk and workshop will follow the performance. The talk will present the design of the instrument, including how its evolution has been shaped by working with composers and performers. The MRP was first created in 2009, and underwent a significant design revision in 2011 in response to feedback from musicians. The talk will also discuss how other digital musical instrument creators can build a community of musicians around their instruments. The workshop will explore techniques for composing and performing with the magnetic resonator piano, working directly with the instrument. Examples will be taken from recent pieces composed for MRP, and there will be an opportunity to try new ideas on the resonator system. Andrew McPherson is a Senior Lecturer in the Centre for Digital Music at Queen Mary University of London. With a background in electrical engineering and music, his research focuses on augmented acoustic instruments, new performance interfaces, and study of performer-instrument interaction. He did his undergraduate and Master’s work at MIT, completing his M.Eng. thesis in Barry Vercoe’s group at the MIT Media Lab. He completed his PhD in music composition in 2009 at the University of Pennsylvania. Before joining Queen Mary in 2011, he spent two years as a post-doctoral researcher in the Music Entertainment Technology Laboratory (MET-lab) at Drexel University. In addition to the magnetic resonator piano, he is the creator of the TouchKeys multi-touch keyboard which launched in a successful Kickstarter campaign in 2013. More recently he has studied how musicians appropriate and misuse technology for creative purposes, creating a new digital musical instrument, the D-Box, specifically designed to be hacked and subverted by the performer using circuit bending techniques.